Why should you buy winter tires? Ontario Motor Sales | Certified Service | Why should you buy winter tires? Think you don’t need winter tires? Think again. All-season tires are great; they perform well in inclement weather like rain and off-road conditions like mud, but they don’t handle snow nearly as well as winter tires do. For example, consider the fact that most all-season tires start to harden and lose elasticity at around 7°C. These tires will continue to lose grip as it grows colder outside, and at around -15°C, the tires will have lost all elasticity. Meanwhile, winter tires only harden at around -40°C. Winter tire treads are specifically designed to perform well in the snow. The wider grooves allow water to drain more easily and keep snow from clogging your tread. Additionally, winter tires are designed with stronger materials to ensure that they make better contact with the road to keep you from sliding. Here at Ontario Motor Sales, we take our commitment to your winter tires very seriously. We know how important it is to keep your vehicle safe during the winter season, both for you and for your family. The chance of collisions occurring increases during the winter season, which is why we recommend that all of our customers ensure their vehicles are properly equipped with winter tires. 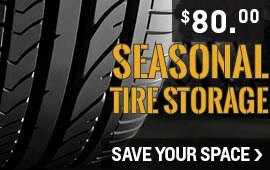 We are happy to store your all-season/summer tires for only $80.00 if you decide to have your tires swapped out with OMS. We tag your tires and store them in a secure, off-site location to give you peace of mind. We also offer a tire cleaning service with our state-of-the-art wheel washing machine and will give all four of your tires and rims a thorough scrub, which is included in the $80.00 fee. If you are just looking for a tire and wheel wash, we can do this for you for just $25.00. It’s nice knowing that your off-season tires will be smiling and ready to go when you get them swapped back on! With premium storage space and a multitude of in-stock tire options, now is the perfect time to purchase winter tires. And you can rest assured that you got the absolute best price for your tires with our 30-Day Price Match Guarantee. If you find a better price on your tires within 30 days of purchasing them, bring us the details and we will gladly refund you the difference. That’s just one small step we’ve taken to ensure that you get the best-priced tires on your vehicle—period. We've broken down our tire packages by Make, Model and size to make shopping for tires that much easier! Find the right tires for you using our online tire store. 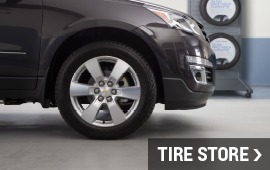 We've listed our customers' top tire deals so you can find something that suits your needs. Price shopping? Go ahead—check us last. We'll match the lowest price, guaranteed. 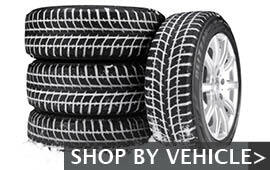 Only $80.00 to store your tires until next winter and receive a tire and wheel wash? Yup! Once we've swapped out those winter wheels, your set will be tagged and coded to your personal account. Take back your space!